Providing bespoke boat name design software is what LiveArt has been doing since the very beginning. Based on stack of LiveArt HTML5 technologies, which include robust SVG graphics manipulation, our team is capable of building most demanding turn-key solutions based on latest popular e-commerce solutions. Your customers will get it covered with ability to preview their boat name, registration numbers and home port immediately and confirm it for order. Complete self-service solution or add-on for your website. 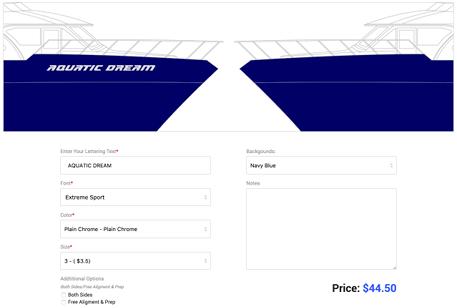 Choosing a right boat name may involve a number of options, yet there is always need to preview it against actual color of the hull. Despite simplicity, we give clear steps and friendly interface for user to design their boat name, registration numbers and home port. Either with standard LiveArt HTML5 or custom-built solution, our team will guide your boat sign project from the very inception to completion. Available as stand-alone app or part of the nopCommerce integration. Not sure if LiveArt is a good match? All of our solutions are customizable. Should you miss any feature, just share us your brief and we will do a preliminary analysis and requirements development phase for you at no cost. 3DLettering manufactures high quality pre-made raised letters for boat naming. The company utilizes tailored lettering designer allowing user to preview an inventory of numerous fonts, aligned for best WYSIWYG experience. Choosing your boat name is one of the many pleasures of buying a new or used boat. See your boat lettering in seconds with the lowest price, best guarantee and the fastest delivery available. We offer 100% satisfaction guaranteed custom boat names with professional results every time, specializing in boat lettering and graphics since 1989.